The Robinson R44 Raven II is a four-seat light utility helicopter powered by a single fuel-injected, angle-valve, tuned-induction, Lycoming IO-540 piston engine. The Robinson R44 is built and developed by the Robinson Helicopter Company in Torrance, California. Design of the Model R44 began in 1985. The first prototype flew on 31 March 1990 and the second in January 1991. Sales efforts got under way in March 1992 at a base price of 235.000 US-Dollars. FAA Type Certification for the R44 Astro was achieved on 10 December 1992, and the first Robinson R44 Astro was delivered in February 1993. In 2000, the R44 Astro was replaced as the main production model by the hydraulically-assisted R44 Raven. The development from the first R44 Astro in 1993, via the R44 Raven I to the first R44 Raven II delivered in 2002, has been remarkable. For the pilot the most important difference is the conversion from a carbureted engine on the Astro to injection and hydraulic controls on the Raven II. Today the four-seat Model R44 is the world's most popular helicopter of with over 6300 delivered to customers all over the world. The ICAO Aircraft Type Designator for the R44 Raven II helicopters is R44. NEH (Notartzeinsatzhubschrauber) Robinson R44 Raven II D-HHRO of Ambulanz Millich-Rettungsdienst GmbH was seen at the helipad of the ambulance station of Ambulanz Millich in Kessin near Rostock, Germany, when in service as "Rettung 029-01-82-1". Registration D-HHRO revers to the car registration HRO of Rostock (Hansestadt Rostock). 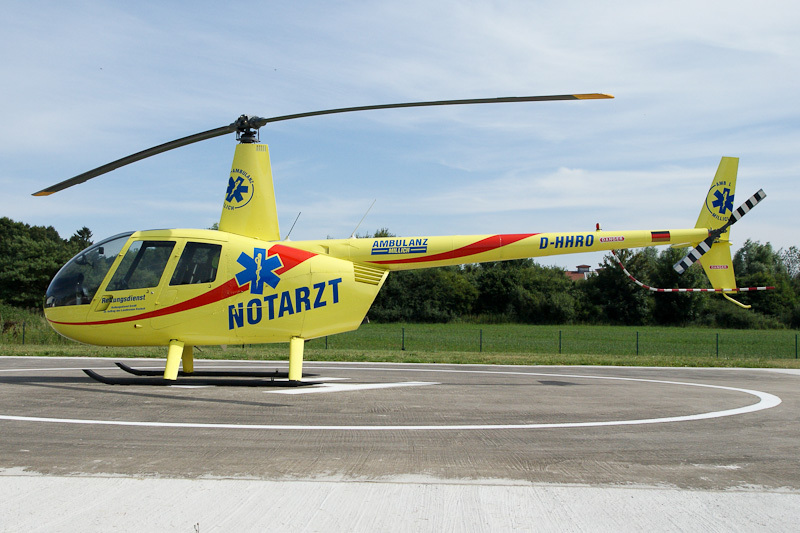 The 2008-built Robinson R44 Raven II c/n 12470 is leased from Heli Flight GmbH and entered service as D-HHRO with Ambulanz Millich-Rettungsdienst GmbH in 2008. The NEH started its operations in 1995 and was known as NEH Bad Doberan. The helicopter is not a rescue helicopter, but is exclusive used for the fast infeed of the emergency physician and a paramedic to the scene of the accident where to the ambulance is going. The NEH is operated in order of the district of Rostock in Mecklenburg-Vorpommern. The medical staff is supplied by Universitätsklinik Rostock. In 2014, Robinson R44 Raven II D-HHRO was replaced in service as NEH with Ambulanz Millich-Rettungsdienst by Robinson R44 Raven II D-HMIA.